Phonem, Virtual Vocalist from PPG. According to PPG, Phonem lets the user create expressive vocal synthesis "beyond anything ever heard before". With its advanced routing system, every aspect of the voice can be controlled and modulated in any possible way - anything from a quiet whisper to a scream. Users can use the intuitive text to speech tool to make Phonem say whatever you want. But while the PPG Phonem was originally designed to do just vocal synthesis, it turned out that the system was also capable of producing a wide range of universal synthsizer sounds, so the parameter ranges were extended PPG and made everything accessible to the user, to take advantage of this fact. The heart of the system is a multi resonator filter with 12 individual resonators which can produce vocal sounds as well as all kinds of filter sweeps and effects. This is combined with a flexible excitation source which can work as a simulation for the human vocal source (the glottis) but also use wavetables and time-corrected-samples (TCS) to drive the filter. The user can dig into every detail of a synthesized utterance, right down to the individual phonemes. Each phoneme can be adjusted to meet the voice of an individual character or a dialect. In addition, there is a pitch-track and a control-track (which makes the voice sing with phrasing and expression). PPG Phonem comes with a modulation matrix - allowing 19 sources to control 40 parameters. In this way the vocals or sound effects can be modified rhythmically using LFOs, envelopes or two X/Y control pads. All these modifications can of course be recorded into the controlling DAW. For speech or vocal synthesis, a versatile excitation generator is provided. PPG also added a wavetable and TCS system, which adds a new dimension to the sound palette. Wavetables can be imported from WaveGenerator or created and edited, TCS can be imported and modified from WaveMapper 2. 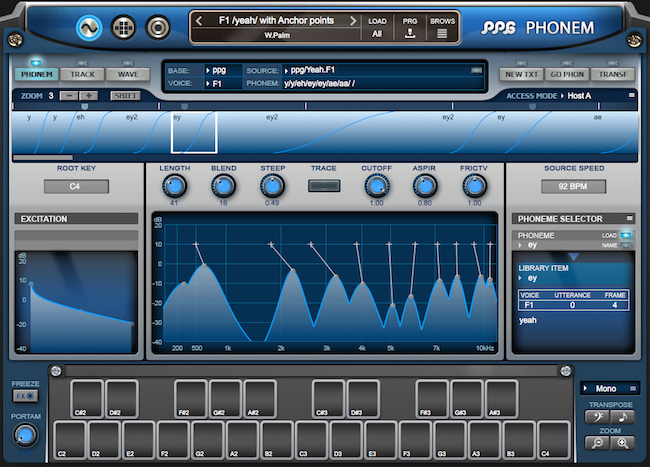 Phonem comes with more than 100 resources and a huge number of presets made by PPG's sound designer team. The browser page allows users to list and sort their sounds, and besides that single presets can be exchanged with another bank of sounds. 5 Keyboard Modes including mono, legato and voice-per-channel. Phonem will be released on November 18th. It will include VST versions (32 & 64 bit) for Mac and Windows as well as 32&64 bit AU for Mac, and no dongle or iLok will be necessary. Announced price is €119. More details at wolfgangpalm.com. WNP Sounds releases new CSC-81 Reaktor block WNP Sound has gathered its C-EQ, C-Comp,C-Verb and C-Limiter Reaktor blocks into CSC-81, a channel strip Reaktor block. Audinate's Dante Via now available Audinate presents Dante Via, a new software that allows users to network their computer-based audio easily and inexpensively. Sonic Faction's Archetype integrated with Maschine One week after making the same announcement regarding NI's Komplete Kontrol, Sonic Faction announces Archetype is now fully integrated with Maschine.